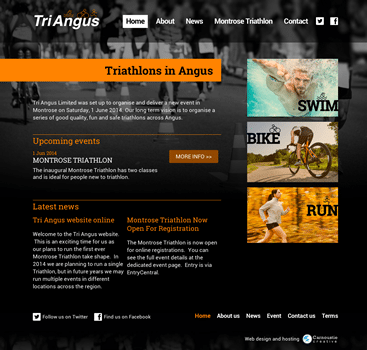 Triangus is a non-profit company formed to run and promote a range of Triathlon events in Angus. They approached us looking for a website that would allow them to not only publicise their first event – The Montrose Triathlon – but would also allow them to raise the profile of the company and promote future events. As with all the websites Carnoustie Creative develop, the Triangus site can be updated by the end users. The page design for the Triathlon details page is fairly complex; making changes to such a design in a text editor could be an error prone and frustrating experience. To overcome this – but still allow the Triangus team to add new events and edit existing ones – we created a structured form. The form allows Triangus users to effectively ‘fill in blanks’ and then create a page for a new event that contains all the appropriate information and matches the same layout as their other events. This saves them money and gives them greater control over their own website – an important consideration for a growing organisation. We created more than an event website for Triangus. A5 Flyers, A3 posters and a pop-up display stand were also designed and printed in the Triangus corporate colour scheme and typeface.